In general, making friends at work make Monday mornings more bearable and over time work a little less stressful. 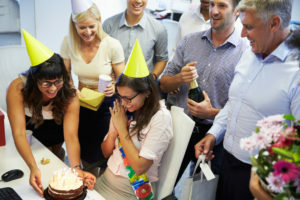 Having friends at work can make an otherwise stressful environment enjoyable, but things can also go sour under different circumstances. In light of International Friendship Day on July 30, we look at the different situations where office friends can become a liability, and how to prevent these situations from ending a friendship. Yes, you want to share everything with your friends. But that’s not always wise when that friend shares an office with you. Talking about family problems, gossiping about work, or having rousing discussion about politics can potentially end in a fight. Even if the conversation started out light or as a joke, you don’t know when your friend might get offended. There are many cases when the offender gets disciplined, or loses his or her job because of workplace conversations that turned into fights. You can’t make excuses for your behavior when this happens, as the company’s HR isn’t likely to consider ‘it’s just a joke’ or ‘my friend doesn’t mind’ as valid excuses. Talk about safe topics, like what you’re doing at work and it always helps to avoid taboo subjects and unpleasant discussions. You shouldn’t talk about each other’s salary and promotions as well. Office romance is subjective, as some companies allow it with certain restrictions, while some are totally against it. Whatever is the situation with your company, you shouldn’t allow your relationship to hinder your productivity and bias your judgement at work. Sure, you can work on projects together and have lunch together, but don’t let this relationship skew your judgement of what’s right and wrong. Don’t favor your partner too much, as that will destroy other friendships you’ve built at work. When you’re fighting, stay professional in the office, and don’t involve your team mates in the fight. They should never be made to take sides. In reality, no, office friends don’t last forever because the job you do together is the main glue that holds the friendship. If you move departments or work in another company, you will no longer spend that much time together. Friendships like this only last if the two people have something else in common, and they form a genuine bond that keeps them together despite different schedules.